Moses in the Wilderness (of Waterville) | Parlez-Vous American? This part of the United States contains a considerable number of French-Canadian famers, often young men of the Beauce, who have found themselves in the difficult place of having to emigrate…by the refusal of the landlords of the place to give out their lands at the moment. The landlords speculate on their lands, in the hope that the “seigneurial sytem” will soon be abolished…this retards development! Whatever the cause, the steady flow of French Canadians to the states, initially as migrant laborers and increasingly as settlers, was a cause for alarm among Canadian officials, especially the Catholic church. Without the guidance of a parish priest, these emigres, heading into the lions’ den of Protestantism, were at risk of losing their immortal souls, as well as any connection to their homeland (and likelihood of return). The Bishop of Quebec and others were right to be concerned. The timing of Fortier’s visit may be connected with the establishment, in the 1830s, of a baptist mission in Waterville aimed at converting French Canadians to baptism. These efforts, led by a Colby College student named Jonathan Furbush, eventually resulted in the creation of the Second Baptist Church of Waterville, sometimes known as the French Baptist Church. It may also be significant that the Diocese of Boston, which theoretically had jurisdiction in Maine, was occupied by an Irish-American bishop, and the Parish of St. Denis in North Whitefield, Maine, was similarly shepherded by Father Dennis Patrick Ryan, another Irish-American. 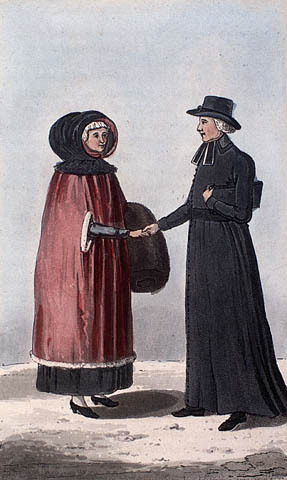 The French-speaking clergy of Quebec were not only concerned about the faith of the Canadians in Maine, but also their language and identity. Fortier’s two reports on his visits to Maine, which he sent back to the Society for the Propogation of the Faith in Quebec City, offer a glimpse into the world of Maine’s early Franco-American communities in the places he visited – Skowhegan, Waterville, Augusta, Belfast and Hallowell (or “All-Well”, as Fortier called it). Setting out from his parish in early July, 1841, and accompanied by a parishoner whom he had chosen to help him serve mass, Fortier set out on a journey into what was still very much frontier country. Although the route had been much improved since Bennedict Arnold’s disastrous expedition along this way sixty-six years earlier, with the laying out of a true road in 1813 by act of the Maine Legislature, the Old Canada Road was still sparsely-inhabited at this time. “I traveled 80 miles without encountering another French-Canadian,” the priest wrote of his first two days on the road. After only a day in Skowhegan, Fortier went on to Waterville, where he spent four days – the longest of any of his stops in Maine. The “village,” as he called it, had by that time a population of at least 125 French-Canadians. According to some of them, it had been seventeen years since they had seen a priest. The days were long. To accommodate the working men of the community, mass began at 5am, and a late sermon was said at 8pm, after the working day had finished for these laborers. Fortier’s work continued until the final confessions were heard at midnight. In Augusta, the scarcity of pastoral care was again highlighted by the case of an Irish woman “on the brink of death” who “had been asking for a priest for ten days” and had traveled a long way to find one. Fortier was pleased to have the opportunity to offer her extreme unction on the day he arrived in the city. She passed away the following day. Since Augusta had only a small number of French Canadian families (Fortier reported hearing confession from 12 adults), he went on to Belfast. The 23 adults and 15 living children in that town were most likely engaged in the shipbuilding industry, though Fortier does not record their occupations. One evening…at the moment when I was preparing to give my sermon, I received a visit from a young minister, who announced himself as having come to discuss religion with me. My lack of practice with the English language, the presence of more than 40 Americans who accompanied this minister, rendered my position awkward. Nevertheless, relying on the assistance of an interpreter, and often of Heaven, I accepted the debate, which lasted four hours, and which turned, thank God, to be to the edification of the French-Canadians who were witnesses. My antagonist, satisfied with what I had said, asked me for time to reflect, and withdrew very humbly. This discussion took the place of the sermon which I had intended to deliver that evening. The centrality of the priest to family life is again demonstrated by Fortier’s tasks in 1842, which included “rehabilitating” the marriages of four couples in Waterville, who had been married in a civil service, but who lacked the authenticity of a church union. Likewise, in Hallowell, the priest was called upon to baptize the child of William Henderson. Henderson’s wife, Charlotte Getchel, a Protestant, was so impressed by the ceremony, that she too converted, having overcome her previous “disgust” at the ritual of confession. Likewise, in Skowhegan, Fortier encountered a mother looking to baptize her dying son. But her husband, a local Protestant, was staunchly against the idea. At first Fortier was reluctant to overrule the wishes of the father, but he was moved by the woman’s desperation, which brought her to tears. Even then, the baptism had to be conducted stealthily, and in private, lest the local Protestants punish the deed. Of course, Fortier’s hope that the trickle of French-Canadian farmers leaving Canada for Maine could be stemmed was to prove ill-founded. Over the next decades, more than a million Québécois would leave the province for opportunities elsewhere, many of them to the same communities visited by the young priest from the Beauce in the 1840s. These communities would eventually grow to the size that they required their own resident priests, many of whom came from French Canada to minister to their compatriots. These pastors played a significant role in maintaining French language and culture among the Franco-Americans in Maine and elsewhere. But Moïse Fortier was not to be among them. Just a few years later, in June 1845, his life was cut short when he drowned in the Chaudière River, on his way to a neighboring parish. The work that he began in Maine, however, lived on.